Winter scarves, hats, suits and socksbecome entangled, lose their couple? 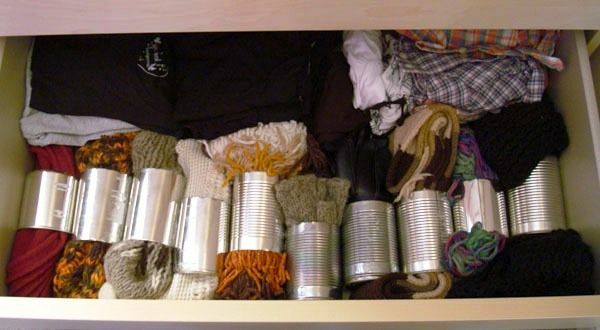 There is an easy way to organize the storage of winter and not only things in perfect order - make an organizer for scarves from tin cans! For each set of things you can usetin can as a ring for a napkin. Banks can be of different size and diameter - from coffee, infant formula, canned vegetables and fruit. Small banks can serve as organizers for pairs of gloves and socks, large ones for scarves and hats. 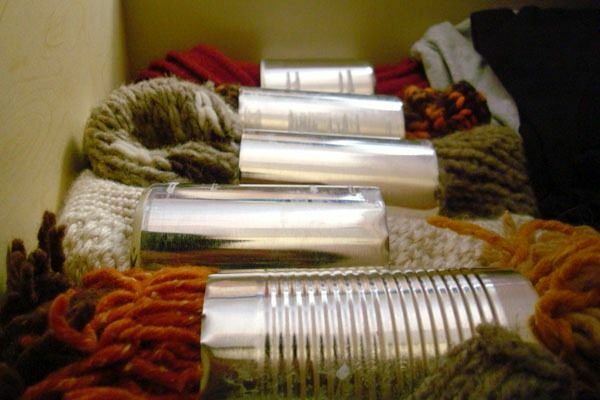 How to make an organizer for scarves from tin cans with your own hands? Very simple. Prepare the jar, remove the label from it, wash it well and boil it to remove all smells and food residues. Then you need to cut off the bottom of the tin can. To do this, use a can opener or scissors for cutting metal. It is very important to remove sharp or jagged edges. Try to bend the uneven edges with the screwdriver to the sides of the jar, and then cover the sections with electrical tape. Such organizers can be used to store threads, tapes and wires, towels and other things. In addition to tin cans, cardboard rolls of large diameter are useful as a starting material.